Micheál Breathnach was born in Belclare, in north Galway, in 1886. 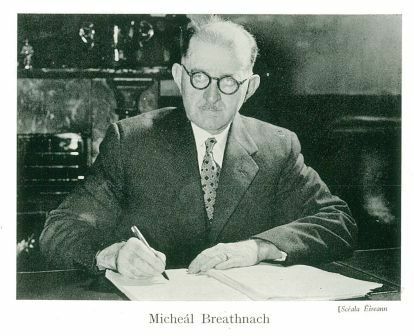 He spent a number of years as a teacher and school’s inspector in Roscrea and in Dublin and was Secretary to the Department of Education from 1944. 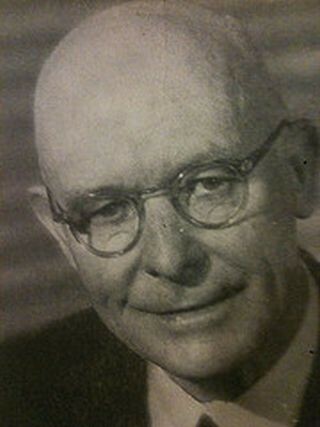 He published numerous newspaper articles, essays, poems, plays and school text books. The following passage is a translation from his autobiography Cuimhne an tSeanpháiste [Memory of the Old Child] (1966), in which Breathnach gives his own memories of the days immediately after the Easter Rising of 1916. Yet shalt thou hear once more the tramp of men. The curlews’ cry was now to be heard, and the tramp of men, in Dublin, Galway and Wexford, and it would have been heard in other parts of the country too if not for the confusion that occurred amongst the leaders. That week was one of immense worry for those who looked forward to Irish freedom. Hope and doubt fought with each other in their hearts; hope that the Gael would succeed and doubt that they could long hold out against the strength of the empire. By the end of the week, when the story went around that the Volunteers had been imprisoned in Dublin, a heavy cloak of pity descended and hope died. Our hearts broke, as we felt that that was the end of the struggle for another few generations. The big question we all discussed then was what would England do to the men who had surrendered? We did not have long to wait. General Sir John Maxwell was sent over to quell the Rising, and he did not hold back in his efforts. The Rising occurred on the 24 April and within a fortnight or so, fifteen of the leaders – the seven who had signed the Proclamation, along with eight others – were condemned and executed by firing-squad. Up to two thousand people were rounded up and sent to prisons and camps in England. The English unsurprisingly were eager for revenge and no-one at the time could see an end to the brutality. It is difficult for people nowadays to understand the furious wave of despair that swept throughout the country as Maxwell began his rampage. No sooner were the shots that killed the leaders fired than the echo of them was to be heard all over Ireland, and it was like a shot through the heart of many people. In the aftermath, there were none who dared raised their voice to highlight the hatred of the Irish manifested and the merciless revenge taken by the British forces. Larry Ginnell fearlessly stood his ground in parliament, but he had no support and felt hopeless; they christened him “the member for Ireland.” And then, when the hope and spirit of the Irish was at it darkest, a clear, strong, independent voice was heard, that aroused the courage of the country; it was a voice that no lord would stand against, and it did away with the shadow of fear. Until the bishop spoke there was bewilderment and confusion amongst the people. The Rising itself confused them, as the majority had no connection to it; and Maxwell’s butchery confused them, as it was a peculiar response on the part of an empire then loudly proclaiming the cause of “gallant little Belgium”, and claiming to protect the small nations of the world in its own name. The bishop’s intervention restored courage and pride to us, and within a week most of the people in the country had united behind the ‘rebels.’ Up to then many had kept their own counsel, and of those in Dublin they were all lying low, or “under foreign key” in English prisons. It was the Bishop of Limerick who first raised a voice in support of patriotism; all Irish people were proud of him and grateful to him, and its only right that we remember his intervention. I myself was so inspired when I read his letter that, that I composed a few verses in English about the whole affair. I sent them to Risteard Ó Foghlú and he saw to it that they were printed and distributed. People liked them, and I think that they are in some of the collections of poems and ballads about the Rising that were published after that. ‘O’Dwyer and Maxwell’ I called it, and even though it’s an insignificant piece of poetry, every word came from the heart.